I’m tripling up (female multi-dexterousness or human laziness – you decide) with this post. It’s not only the completion of my short Three Tools series, but will do for a Wednesday #ROW80 Checkin and for a #IWSG Insecure Writers’ Support Group June post too. Go, me! I just read the latest edition of Writer’s Digest (when I say latest, be aware it takes several weeks to get here from America). In an article dedicated to tools to help in writing conflict, James Scott Bell talks about the Novel Journal, a concept taken from Sue Grafton. (You can see some of Sue’s own journal notes for some of her published A-Z Crime fiction series at her website). I prefer to think of it as The Project Writing Journal, but it also acts as a Developmental Journal – but a name is just a name. There are all kinds of Writer’s journals, and each is used a little differently from one to the next writer. They can be called by different names, used for creative writing development, pre-writing or warm-up exercises, or simply as a day journal for the purposes of self-discovery and the practice of writing. They can be in notebooks, moleskines, leather books, or computer files. But, the particular tool I’ve used successfully over the past few weeks, forming that 21 day habit, is a specific Writer’s journal linked in with the development of a writing project. In essence the Novel Journal is simply a writing journal used during the writing project at hand. Kind of like Julia Cameron‘s The Artist’s Way “Morning Pages”, we should take some time in the day before continuing with a WIP to write out our latest dreams, worries, and ideas about the project. James Scott Bell gave some examples of questions and ideas which may have been found in a journal of a plotter or a pantser. In some cases where a problem was still bugging the example journaler, he gave himself permission to sleep on it. I tried it out these last weeks. It took me several thoughts before I could even give myself permission to start the thing electronically. Cameron’s morning pages were always “suggested” they should be longhand or manual – something about the process of pen to paper providing a different creative challenge where magic would meld with the mind. After three pages in longhand, I always wanted to: 1. Burn the evidence of my psycho personality before somebody in the house stumbled upon them, and 2. Rest from writing to allow my aching hand to register a grip again. The later was important. I found that after handwriting some morning pages, it hurt to start actually writing any story. As much as I grasped and wanted to embrace the concept, in that state – morning pages and I didn’t have a particularly good relationship. And I tried a good dozen times. In fact, and this may seem sacrilegious for a writer, but I’ve never been a good journalist at all. From early school age, I tried keeping a diary most new years. They survived until mid January, if lucky. Down under, we had our long summer holidays over that month, and contrary to popular belief, most of those long days weren’t full of remarkable adventures, or holiday trips. Most of the journal entries were about long hot days of being bored, doing not much and waiting for the return from family holidays of my friends and the expectations of the new school year. No wonder the diaries didn’t last. Despite having notepads and notebooks, moleskines and cheap rich papered journals brought back from India, I still don’t journal, note take or use them as I am told I should. Enter the e-age, though, and things have drastically changed for me. Knowing now that I naturally get on better – and manage to get the thoughts out of my head quicker – via keyboards, monitors and technology in general, I finally decided the best place for such a novel journal would be within the software currently holding the novel itself. I’m using Scrivener (1.0 for Windows) so created a new folder under research, called it “Journal”, and began a daily entry text file. Just like that. I’ve tried using journalist software before, and goodness knows, there are now plenty of apps for that nowadays too. But there’s something about a date blinking at me at the top of a blank page – every single day – the horrible obligation to fill it, that was equally off-putting whether on e-paper or real-paper. That’s why I made my writing journal linked simply into the writing project itself, and as informal as possible. A simple rich text file, stick in dates or times of the day as I please, and use it for whatever my brain needed to do with it. I have a two-pronged approach. A month journal is where I start my morning (and afternoon, or breaktime) stream-of-consciousness journaling. This journal allows me to release stale thoughts from the day or night before (and I’ve also documented down two dreams I had that hung over me, both of which would make good short stories for the future – and are moved over to another type of project or journal file – the Ideas or Compost Journal – again, a name is just a name, the importance is in having one). This side of the journal is returned to during the day. I use it to develop thoughts, ideas, or moan and groan about something that might be bugging me about the story. I used to do a similar thing mentally – often story problems or sudden ideas would (and still do) come to me away from the actual WIP – over the kitchen sink while doing the dishes, or while taking the dog for his walk. When that happens now, I have a place to go to, to jot the ideas down. I realised that some of the questions and resolutions forming out of the free-style format of the writing journal needed to be better organised. 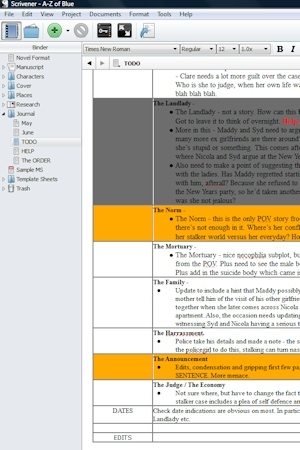 First off the bat, I created a worryingly large To Do list – scenes (stories) needed to be completed, then other aspects I’ve been musing over lately – covers, quotes (see part 1). Then I started to bullet point out all the missing stuff, and areas that were lacking. An additional list became the Question page. Some of the problems which had been nagging at me were solved with a conversation on that page, a few weren’t, so I had to tell myself to solve it later. I wrote “help” beside them, like a little prayer to my subconscious. I use color coding to differentiate levels of need and urgency too. The question page (issues) also helps in the actual writing process. When I get to a point in the drafting where there is an issue in need of thought or further research, I make a note in the draft, then move the issue over to the journal, and move on with the story. Some of the nagging questions I will take into an actual journal entry and use that format to come up with ideas to resolve it. Despite my call to the gods or muse to help me resolve the critical questions overnight, it didn’t quite work like that. I found that it took a few days and then a marathon effort of working through the questions in one sitting to check off some of them. I add other pages as needed. A benefit of making this electronic is that keywords and titles allow a quick search, and rich text files have no constrictive length to them – they grow as I need them. Having the writing journal as a tool has put a more secure and dependable process around the story. The journal inside the project has also added a little discipline to something like the morning pages. When I open my writing software first thing in the morning, I now always go to the journal first, and that forms the habit of writing immediately. Creating it and using it flexibly and in a format I work best at (electronically, and able to duck and dive into it over the writing day) has found me one of my own favourite writing tools. Other writers use their own writing diaries differently, but in finding the Novel Journal concept, I appear to have found a workable solution for my writing in progress. A Writer’s Journal – discusses two such journals that John Steinbeck wrote in during the drafting of Grapes of Wrath and East of Eden. Interesting post! 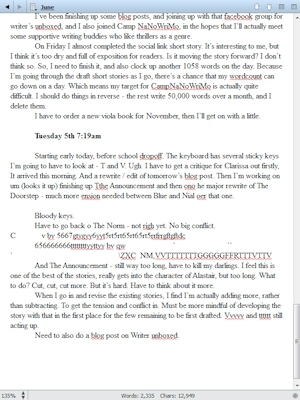 I have notes in word, notes in my paper journal for my story, as well as snippets of a lot of other things, and I find it helpful to write all that stuff out, but I do get frustrated not being able to find all those “notes” and “questions” when I sit down at my WIP – part of the reason for this is that I have several notebooks traveling around the house and various bags/purses for different ocassions – taking kids to dance, going to the grocery store, living room journal vs. bedroom journal – I started the multiple journal system because I have a tendency to have ideas hit me in the head in the middle of somthing mundane like dishes, laundry folding, etc. I am new to scrivener but I can see the benefits of keeping it all in one place and being able to search the text for key words, highlight problem areas with color codes – sigh, it sounds wonderful. 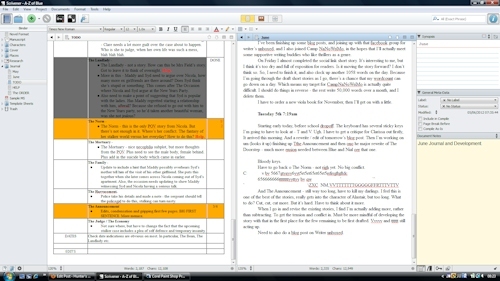 However, I don’t always have my laptop with me . . .I guess I could transcribe my WIP notes over to scrivener . . .hmm. Thanks for all the food for thought and your wonderful post! Tyrean, I hear you on the thoughts on the go thing. I’m lucky that I tend to retain those thoughts enough to write them in once I get back to the computer. I also own an iPAD, and have various apps for writing and notetaking on there. Using dropbox, I can move those mobile notes over. I have read of some writers who have an entire system where they use an iPad and an app like Elements, and synchronise between Scrivener and dropbox. However, I am on windows, and Scrivener 1.0 for windows doesn’t have the full synching potential as the Mac Scrivener 2.0 does, particular between Simplenotes, which is a text file and synching app in one, and which is supported (I may be wrong) by Scrivener 2.0 in the software itself, so you have version control. For me, synchonising through dropbox seems overly complicated when dealing with files all over the place, so I tend to stick to the odd physical notebook or using the iPAD on the go, and then transferring any to do’s, or outstanding questions etc into Scrivener when I go in to journal. A lot of writers stick to the physical journaling, and in a way I can understand why – it’s like that of real books, the smell and tangibility of all of it. Nothing wrong with any system you use, if it works for you.